Sometimes life events bring with them the need or desire to opt for a smaller living space. Unfortunately – though not always – this entails either getting rid or moving into storage some of your possessions. The thought of having to unload or say goodbye to belongings that have been with you for a long time, some of which may hold a great deal of sentimental value for you, can be an unpleasant one. 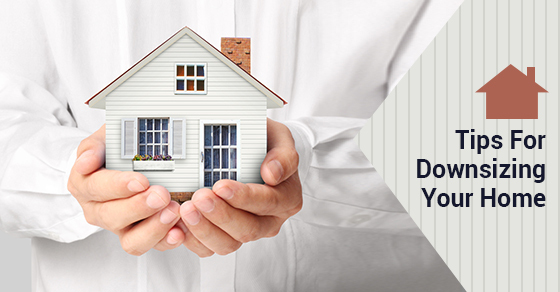 Here are 5 tips that can help you make your downsize simple and stress free. Create a list of your “must haves.” Knowing what you need and can’t live without can give you a much clearer idea of what is ultimately important to you. People tend to attach themselves to absolutely everything they own, but creating a list of priorities will allow you to let go of things you don’t need much easier. Give yourself plenty of time to get rid of things before you move. Getting a feel for what you are going to need to pack is something you will want to do well in advance. Start sifting through closets, attics and basements at least a couple months before you know you are going to be moving. Day by day you will narrow down what you are going to be taking and what you are going to be getting rid of. Compare room sizes. Get a feel for room sizes in your new space by comparing them to ones in your current space. If you are planning on moving your entire bedroom into your new bedroom, furniture and all, take some measurements of both to see if, realistically, everything is going to be able to make the transition. Curate your moving list based on sentimental value. Kitchens and garages are common places where one finds items that tend to lack sentimental value. Spatulas, mixing bowls, or dilapidated egg -beaters can go. Grandma didn’t get that weed-wacker during the war. It can go too. Be a responsible mover. Items that can be recycled or repurposed should be. Anything you think another person or family may be able to use: donate. Downsizing does not have to be a catastrophic event. You can take pre-emptive measures to make sure that you are bringing and discarding items efficiently, that you feel comfortable you are accounting for space in your new home accurately, and that you are minimizing the environmental footprint of your move.